MILAN, Italy, May 26, 2013 (ENS) – Glaciers in the Mount Everest region of the Himalayas have shrunk by 13 percent in the last 50 years and the snowline has shifted upward, finds a Nepalese scientist conducting research for his PhD studies at the University of Milan. The snowline has retreated by 180 meters (590 feet) up the world’s tallest mountain, which rises 8,848 meters (29,029 ft) above sea level. Sudeep Thakuri and his team determined the extent of glacial change on Mount Everest and the surrounding 1,148 square kilometer (713 square mile) Sagarmatha National Park by compiling satellite imagery and topographic maps and reconstructing the glacial history. Their analysis covered the years from the 1950s to 2011, providing the longest time series of glacier variations ever done in this region. Statistical analysis shows that the majority of the glaciers in the national park are retreating at an increasing rate, Thakuri said. Glaciers smaller than one square kilometer are disappearing the fastest and have experienced a 43 percent decrease in surface area since the 1960s. Because the glaciers are melting faster than they are replenished by ice and snow, they are revealing rocks and debris that were previously hidden deep under the ice. These debris-covered sections of the glaciers have increased by about 17 percent since the 1960s, according to Thakuri. The ends of the glaciers have also retreated by an average of 400 meters since 1962, his team found. The researchers suspect that the decline of snow and ice in the Everest region is from human-generated greenhouse gases altering global climate. However, they have not yet established a firm connection between the mountains’ changes and climate change, Thakuri said. To evaluate the temperature and precipitation patterns in the area, Thakuri and his colleagues have been analyzing hydro-meteorological data from the Nepal Climate Observatory stations and Nepal’s Department of Hydrology and Meteorology. 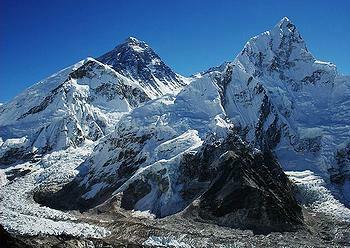 They found that the Everest region has been warming while snowfall has been declining since the early 1990s. The region has undergone a 0.6 degree Celsius (1.08 degrees Fahrenheit) increase in temperature and 100 millimeter (3.9 inches) decrease in precipitation during the pre-monsoon and winter months since 1992. Thakuri plans on future research exploring the climate-glacier relationship further with the aim of integrating the glaciological, hydrological and climatic data to understand the behavior of the hydrological cycle and future water availability. Thakuri presented his findings at the American Geophysical Union’s Meeting of the Americas in Cancun, Mexico earlier this month. The UN’s Intergovernmental Panel on Climate Change and the Water Research Institute-Italian National Research Council are funding this research.